Brilliant I love Skye and have visited many times. 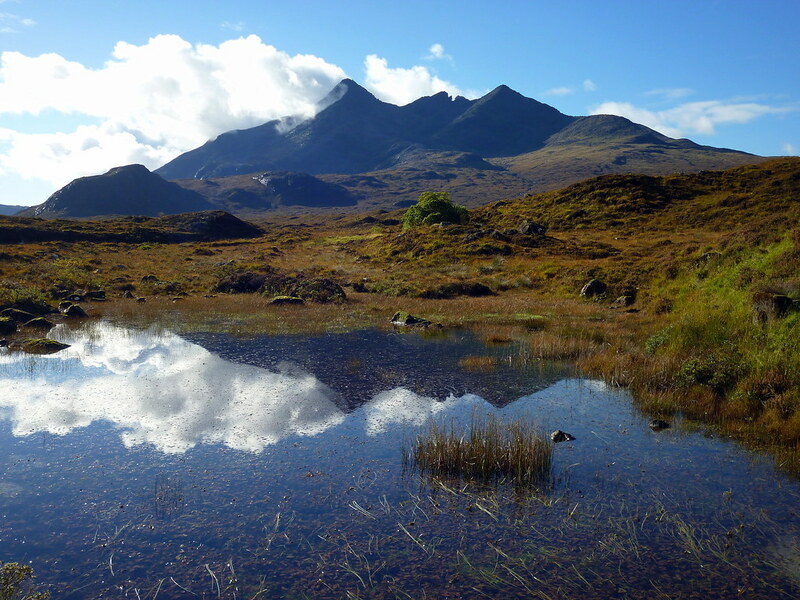 Your report was fantastic with the Blaven diversion being particularly inspired. In fact reading your report makes my heart ache for Skye and I can give it no higher praise than that. Thank you for all your kind replies. I'm glad you enjoyed the read. The Skye Walk will always be my reference point now for how good a long distance trail should be I think it will grow in popularity as the years go by. The reports you guys posted here are very very valuable! Great report and great photos of the best place in the whole of the UK. Thanks Jide and Lenore - glad you enjoyed it second time around. Ric - I see you managed to miss the water pipe that went in the water. It's a cracking view from there if you can time it right between the tourist buses. I was with a photographer down at the Castlerigg Stone Circle in the Lake District who had set up and was patiently waiting for the sun to dip to catch the light on the hills....cue the busload of Japanese tourists who swarmed over the place and stole his moment He wasn't laughing though. Cheers Al - glad you enjoyed it and you didn't choke on your sarnie. Citylink from Glasgow - Portree is only £5 one way at the moment, hoping next week it's the same price for the way back. I'm planning on staying at the hostel at Flodigarry the day before starting and after doing the 1st stage (least I won't need most of my gear) and a hostel in Portree after stage 3 with wild camping the rest of it. Are you going to start from the top of the island, and have you got any detours planned? I wish you dry weather and sunshine. Looking forward to seeing some pictures. aye, starting from the top and working my way down. It seems that everything has already been said on your walk report A pleasure for reading and full of interesting hints . I must say that I found it after having planned most of my route, so I think I'll stick to the plan and will report the differences after. I intend to go North-South and making a detour through Glen Brittle. Still, as I intend to backpack all along with a tent, I would need one more kind of information about logistic stuff: is there a 'lot' of place to refill our food supply ? My main concern is about the stages between Portree and Broadford.I intend to stop around Sligachan, Glen Britle, Elgol and Torrin which seems to be small place and may be without any shop. Hello Marc - here's hoping you have some decent weather. I don't know about Sligachan apart from the hotel. I assume they sell some basics in the campsite - I'm sure someone on here will know more details. Also the same with Glen Brittle, but as it's fairly isolated I would think the shop there has decent supplies. There is a small store in Elgol selling basics, but no store in Torrin. There is the Blue Cafe which may help out if you contact them before you go. Dave Woods can probably help you out with the question about the gas cartridge. Good luck with the journey and I look forward to reading all about it. Great read and great photos, we (group of 4) are going up 7th June 14 for one lads 60th birthday going N-S, my first time on Skye, ) hoping the weather is kind and the midges aren't too bad.